I mentioned before that I read Blood Red Road between this and The Knife of Never Letting go so I didn't have back to back by the same author, only to find out those two books were extremely similar. 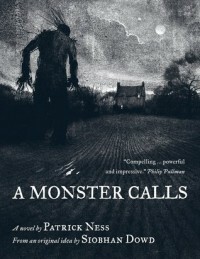 A Monster Calls has almost nothing in common with KNLG. Well, it's middle grade male protagonist. But it's a paranormal book set in contemporary times. Conor's monster comes at midnight. He's been struggling in school and is being bullied. His mother is being treated for cancer. And a monster keeps showing up at midnight and wants the truth. I can't go much more into the book, other than to recommend it.